Now this is a hard thing for me and maybe it’s just me that this effects, but I am wondering if you have ever felt this way too. Now, when I started in business, I was 18 years old. I was self employed, and I thought I had a job, but I was only working for myself. I didn’t realize that because I was working with someone and they were telling me what to do, so I thought I was working for them, but I was actually working for myself. Now, after a few years of that, and I finally figured it out, I decided to go out on my own way. I started my own company called Triangle Fire Protection Company so I went from working for someone to being my own boss. Years later, I had built up the business, we had a great income, and wonderful customers. Then I sold it for a big juicy check. Once I did that back in 2003, I started dabbling in Internet Marketing. I did okay and then I eventually started up Fire Protection Online. I have made millions here and sold a lot of fire protection equipment over the years. Then I made my way to America and attended my first conference. It was there that I discovered that people like me call themselves entrepreneurs. At that point, I thought an entrepreneur was someone like Richard Branson, or someone who could look at a business an just start it from that moment. Even the people from the stage who were doing the conference was calling all of them entrepreneurs, and I wondered, is that causing a help or a hindrance? In effect, I can joke about this, but the vast majority of the entrepreneurs there were people without a job, but who could get a job, but they were learning how to make money and build a business online. 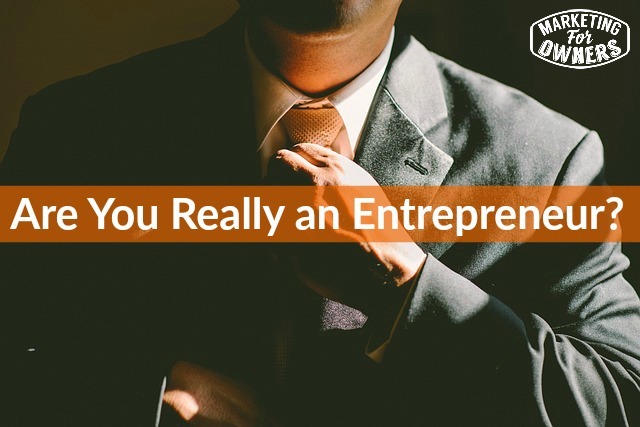 But does that make you an entrepreneur or does that make you unemployed? What I think is that it is a state of mind. If you are self employed, such as construction or plumber, you are not an entrepreneur — you my friend, are a business owner. In my opinion, an entrepreneur is someone who has an entrepreneurial spirit — you think of how continuously build your business, and your mind never stops thinking about improving your business or that of someone else. I think we should carve our own path and do what we what and not worry about everyone else’s opinion. Are you an entrepreneur who wants to build build build or are you a business owner who wants to constantly improve your business? Today is Thursday and that means it is time for the Drive Time Podcast. 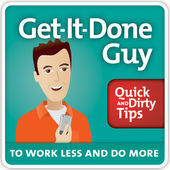 Today we are talking about the Get it Done Guy by Stever Robbins. He does a daily tip about 6 or 7 minutes long and he shares how to be efficient in your day. It is just plain brilliant. This is well worth a listen! Go check it out and let me know what you think and I will be back tomorrow.